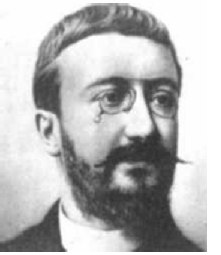 Alfred Binet (1857–1911) was a French doctor who worked in the neurological laboratory at the Salpêtrière Hospital in Paris, and later went on to work at the Sorbonne’s Laboratory of Experimental Psychology. He and his collaborator, Theodore Simon, invented the first intelligence test. It consisted of 30 items of increasing complexity. Results were measured against a mental age. For example, if a child achieved a score equivalent to the average score of five year olds, they would be said to have a mental age of five. Levels of intelligence could then be determined by comparing the child’s mental age with his or her actual age. This test … consists essentially in this: a word of a text is omitted and the subject is asked to replace it. The nature of the intellectual work by which the gap is filled, varies according to the case. This may be a test of memory, a test of style, or a test of judgment. In the sentence: ‘Louis IX was born in ——‘ the gap is filled by memory. ‘The crow —– his feathers with his beak’; in this the idea of the suppressed word is not at all obscure, and the task consists in finding the proper word. We may say in passing, that according to the opinion of several teachers before whom we have tried it, this kind of exercise furnishes excellent scholastic training. Lastly, in sentences of the nature of those we have chosen, the filling of the gaps requires an attentive examination and an appreciation of the facts set forth by the sentence. It is therefore an exercise of judgment. Procedure. We have simplified it by suppressing all explanations. The words forming the gap are intentionally placed at the end of the sentence. It is sufficient to read the text with expression, then suspend the voice with the tone of interrogation when one arrives at the gap. The subject naturally fills in the gap. If he does not do so spontaneously, urge him a little by saying, ‘Finish. What must one say?’ Once the operation is set going it continues easily. —The weather is clear, the sky is (1) blue. —The sun has quickly dried the linen which the women have spread on the line. The cloth, white as snow, dazzles the (2) eyes. —The women gather up the large sheets which are as stiff as though they had been (3) starched. —They shake them and hold them by the four (4) corners. —Then they snap the sheets with a (5) noise. —Meanwhile the housewife irons the fine linen. She takes the irons one after the other and places them on the (6) stove. —Little Mary who is dressing her doll would like to do some (7) ironing, but she has not had permission to touch the (8) irons. Another consideration. Our purpose is to evaluate a level of intelligence. It is understood that we here separate natural intelligence and instruction. It is the intelligence alone that we seek to measure, by disregarding in so far as possible, the degree of instruction which the subject possesses. He should, indeed be considered by the examiner as a complete ignoramus knowing neither how to read nor write. This necessity forces us to forego a great many exercises having a verbal, literary or scholastic character. These belong to a pedagogical examination [rather than a psychological examination like this one]. We believe that we have succeeded in completely disregarding the acquired information of the subject. We give him nothing to read nothing to write, and submit him to no test in which he might succeed by means of rote learning. In fact we do not even notice his inability to read if a case occurs. It is simply the level of his natural intelligence that is taken into account. It seems to us that in intelligence there is a fundamental faculty, the alteration or the lack of which, is of the utmost importance for practical life. This faculty is judgment, otherwise called good sense, practical sense, initiative, the faculty of adapting one’s self to circumstances. To judge well, to comprehend well, to reason well, these are the essential activities of intelligence … Indeed the rest of the intellectual faculties seem of little importance in comparison with judgment.